If there’s something I really love it’s quick comfort food and this creamy mushroom risotto is just that! I mean what better way to celebrate Autumn? 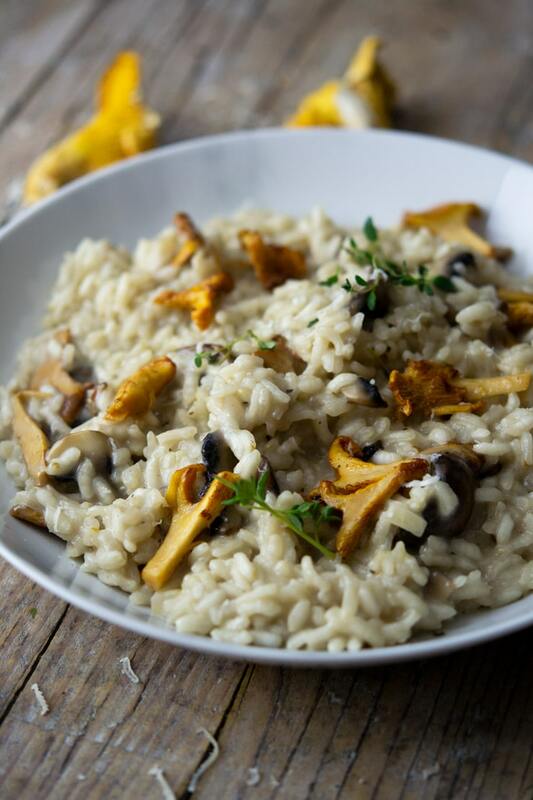 Delicious chanterelle and chestnut (crimini) mushrooms are mixed through mouthwatering silky arborio rice with mascarpone and parmesan. It’s just SO good! Risotto is so simple to make and doesn’t take long at all. It’s a quick and cost-effective way to make a filling and satisfying meal on busy weeknights. I always have arborio rice in the cupboard and chicken stock either in the freezer or store cupboard so I can whip up a risotto any night of the week. Always use either Arborio or Carnaroli rice for making risotto. Use homemade chicken stock preferably for the best flavour. If you don’t have homemade stock then go for a good quality store bought option and try going for a low sodium brand so you have more control over the seasoning. Simmer the risotto slowly on a medium to slow heat, stirring often. Don’t be tempted to speed things up and turn up the heat, the flavour won’t be great and either will the texture. Use high-quality ingredients, always. If food is simple you need quality. Add olive oil in a large pan under a medium heat. Finely chop the onion and add to the pan, saute until the onions are translucent. Add the garlic, mushrooms and thyme leaves to the pan with the onions, fry for 2 minutes stirring occasionally (photos 1-3). Add the arborio rice and stir until it has soaked up all the flavours and mixed thoroughly with the onions and mushrooms (photos 4 & 5). Add around 2-3 ladles of chicken stock until the rice is covered and add a small pinch salt and pepper. Stir constantly until the rice starts to absorb the stock. Continue adding one ladle of stock at a time allowing the rice to absorb the stock each time whilst constantly stirring. Continue until stock is used up, the rice should be perfectly cooked at this point (photo 7). Turn off the heat and add around 2 tbsp parmesan, the mascarpone and any extra salt if needed. Stir everything together an serve in bowls (photos 8 & 9). I always make my risotto slightly sticky and creamy rather than loose. I much prefer it this way but if you want yours a little looser just add a little extra water or stock until it’s at the consistency you like. What Mushrooms Can I Use? You can also try using different varieties of mushrooms, chestnut (Crimini) and chanterelles are really delicious and fairly easy to come across at most supermarkets or farm shops. You could also use common white button mushrooms, portobello, porcini (<< really delicious) or any other mushrooms you can easily find. Different varieties give all sorts of delicious, earthy and woody flavours so depending on the mushrooms you choose the end result will be different. For an extra mushroom kick, you could rehydrate dried porcini mushrooms by soaking them in a little warm water for 10 minutes, finely chop them and add them to the risotto along with the mushroom liquid. Tip: Just be careful when pouring in the mushroom liquid as it tends to be gritty toward the end, you don’t want that in your risotto. If you’ve tried this Creamy Mushroom Risotto or any other recipe on the blog please let me know how you got on in the comments below, I love hearing from you! You can also FOLLOW ME on FACEBOOK, TWITTER, INSTAGRAM and PINTEREST to see more delicious food and what I’m getting up to. 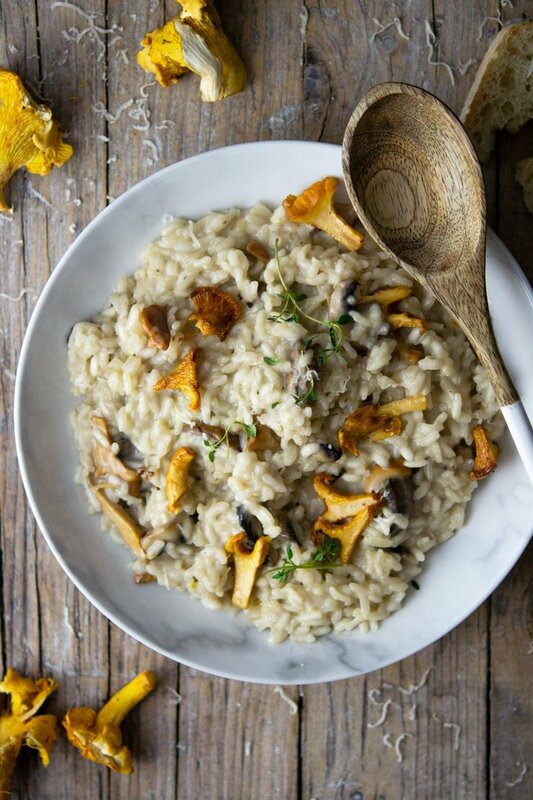 A super easy Creamy Mushroom Risotto made with chanterelle and chestnut mushrooms, fresh thyme and parmesan cheese, This risotto is ultra comforting and great for busy weeknights! Put the chicken stock in a pot under a medium heat. Add 2 tbsp olive oil in a large pan under a medium heat. Finely chop the onion and add to the pan, saute until the onions are translucent. Add the garlic, mushrooms and thyme leaves to the pan with the onions, fry for 2 minutes stirring occasionally. Add the arborio rice and stir until it has soaked up all the flavours and mixed thoroughly with the onions and mushrooms. Continue adding one ladle of stock at a time allowing the rice to absorb the stock each time whilst constantly stirring. Continue until stock is used up, the rice should be perfectly cooked at this point, if not you can add an extra 100ml (1/3 cup) of water or stock. Turn off the heat and add 2 tbsp parmesan, the mascarpone and any extra salt if needed. Stir everything together an serve in bowls. Tip: Just be careful when pouring in the mushroom liquid as it tends to be gritty toward the end, you don't want that in your risotto. Use homemade chicken stock preferably for the best flavour. If you don't have homemade stock then go for a good quality store bought option and try going for a low sodium brand so you have more control over the seasoning. Simmer the risotto slowly on a medium to slow heat, stirring often. Don't be tempted to speed things up and turn up the heat, the flavour won't be great and either will the texture. I always make my risotto slightly sticky and creamy rather than loose. I much prefer it this way but if you want yours a little looser just add a little extra water or stock until it's at the consistency you like. Oooh I love risotto! Can’t wait to make this version. Delicious! Just made a batch of mushroom risotto last night, bit of chicken too. Leftovers tonight! I used the liquid from soaking porcinis for something else, instead of chicken broth. 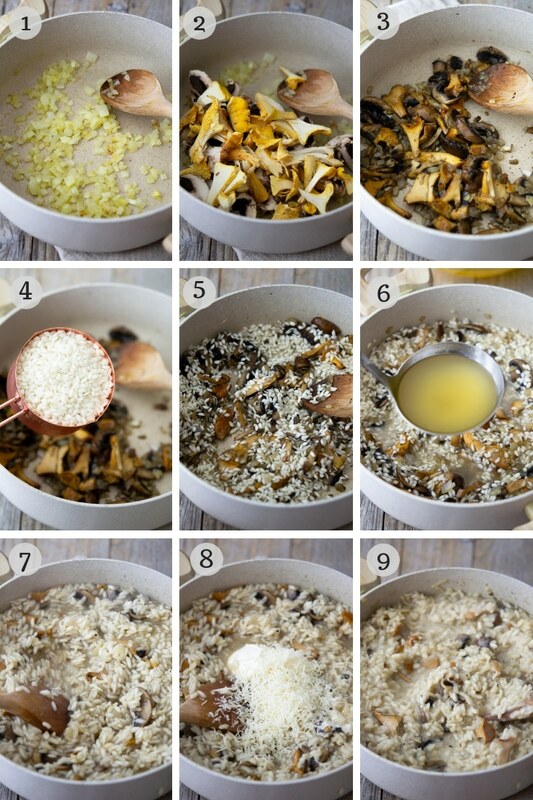 I’m not lying when I say this is the most amazing mushroom risotto I’ve ever seen…. it’s so pretty and I bet it tastes even better! Aw thank you so much, Amanda, that comment just made my day! 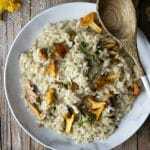 Mushroom risotto is my favourite! Oh this looks heavenly! So creamy- exactly like risotto should be. I hate dry risotto! And like you I have a wedge of Parmesan just waiting to be grated all over this! Risotto is one of my favourite comfort foods but I’ve never added Ricotta to mine. Definitely going to give that variation a try next time. Thanks for the inspiration. This risotto looks so creamy! Must be the ricotta, yes? Hey Lisa, yeah the ricotta gives the risotto it’s lovely creaminess, it’s delicious! I’m ashamed to say I’ve never made Risotto- this looks so creamy and delicious! You make it sound so easy to make- I’m going to have to try this! I can never get risotto right when I make it, so I am going to have to give your recipe a try. It looks great.